So you’ve chosen which of your new headshots to use – now don’t forget to use it everywhere you can! Get your brand out there, and make yourself and your business recognisable. The more people see you, the more ‘know, like and trust factor’ you build, and the more likely they are to buy from you. Firstly of course, update your profile photo on all your social media accounts. Use the same photo on every business page, as it helps your business look more professional and consistent. Plus either the same one or a pick a different one just for your personal social media profiles – remember that potential customers/clients will often see your personal profile when posting in facebook groups etc. Update them all, including any that you only rarely use. Just updating these may well send a notification to all your followers, reminding them of your existence, and maybe even reminding them to get in touch to buy from you. (I can resize any of your chosen photos for different places if you need). The ‘About Me’ page on your website could do with a new photo of you couldn’t it! Plus any other ‘Meet the Team’ / Department type pages that you appear in, and it might be good to have one on your ‘contact me’ page and even home page. Why not show it off to your customers in your next newsletter. How about adding it to your emails too, so your friends as well as customers can see it. Think about adding it to your next batch of business cards. I have it on mine now, after seeing others use it this way. I think it really helps to remind people who you are, when all they have is your card and possibly a vague memory of meeting you somewhere! It makes it so much more personal, and definitely helps you to be remembered when lots of people are met at the same time. Don’t forget Google +, Google Business, and any other online directories that you may be listed in. Update or add your photo everywhere that you might exist online. Write a blog! Share your new photos in a blog post. You could encourage engagement from your readers by asking them to pick their favourite one for you to use, or simply show them off. Enjoy using your new photos, and let me know if there are any other ways I have forgotten to include! 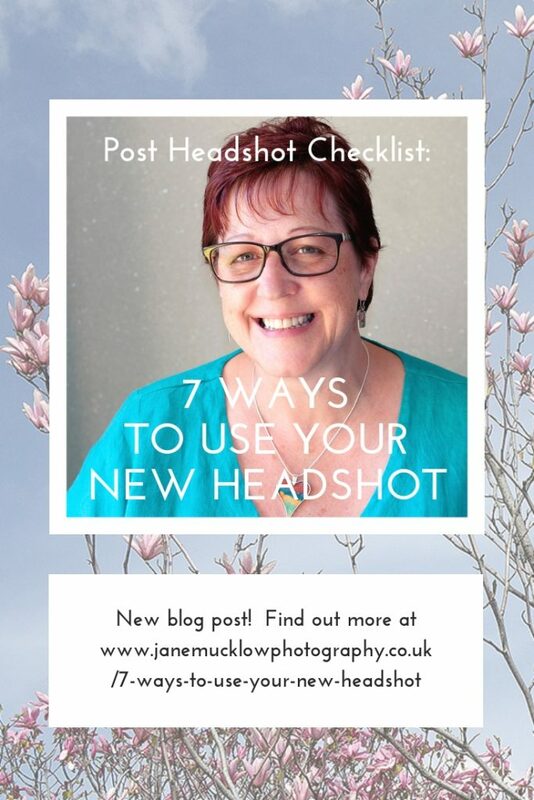 If you don’t have a new headshot that you are confident sharing everywhere, have a look at my Headshot Info page and let me know if it is time we updated your profile photo. Or even if you fancy a whole set of personal/business branding portraits including new headshots to use too. The photographs used as examples on this page were taken at the 2018 Release Your Brilliance event.